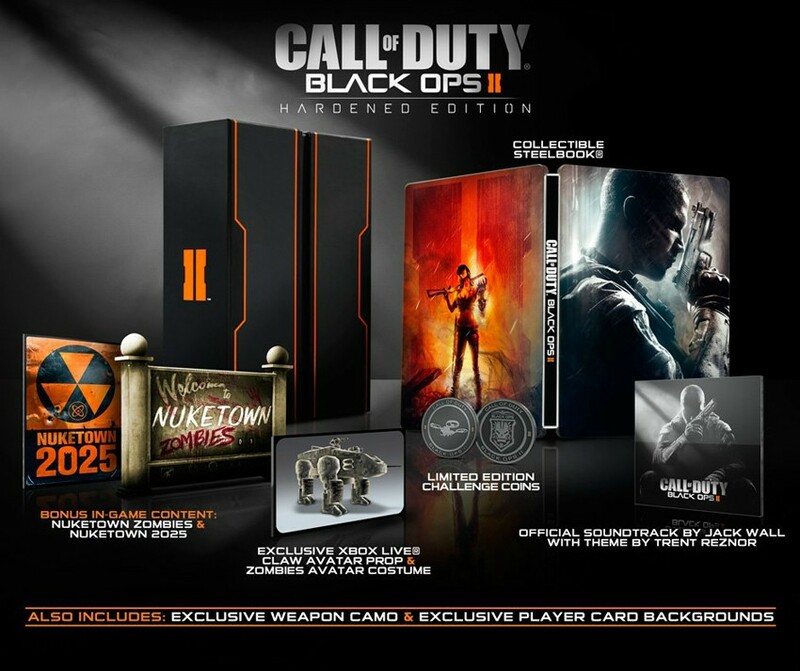 Call of Duty: Black Ops 2 will be available in two special editions, in keeping with series' traditions. At the GameStop Expo in Texas, Activision revealed the two bundles that players will be able to splurge on this fall. The Prestige Edition, also known as "The Less Crazy Collector's Edition," comes in a limited edition Steelbook case. Inside is a copy of the official soundtrack and two challenge coins. Also included are download codes for the Nuketown 2025 and Nuketown Zombies maps, exclusive weapon camo, and exclusive player backgrounds. The Xbox 360 edition also comes with a zombie costume for your Xbox Live Avatar and drone prop. Its PS3 counterpart comes with two exclusive background themes. 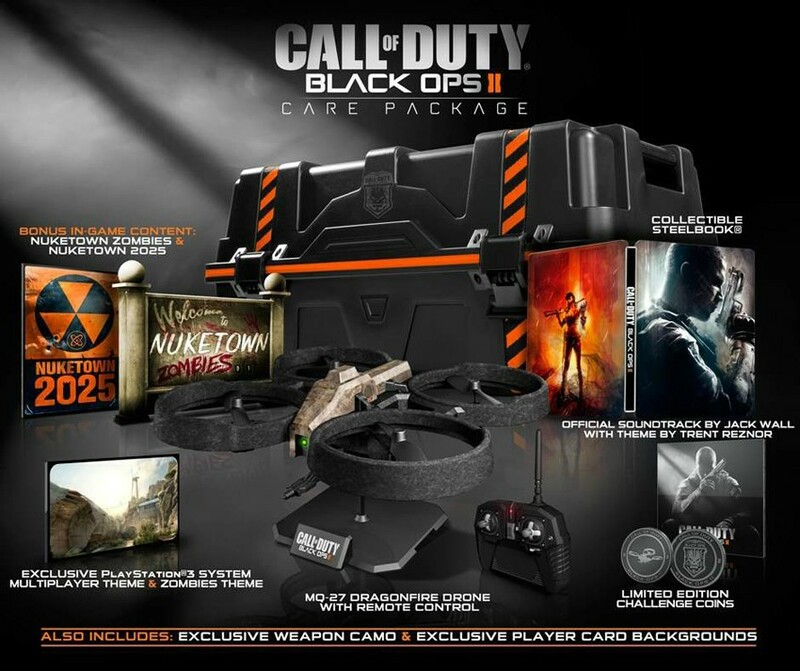 The Care Package Edition comes with everything in the Prestige Edition, in addition to a remote control Dragonfire drone. What's more, the whole bundle comes in an enormous crate modeled after the care packages from competitive multiplayer modes. It's maybe not as large as the actual care packages from the game but it's very enormous nonetheless. The prices for these limited editions haven't been announced yet. Past games in the series lead me to believe the Prestige edition is around $70-80. 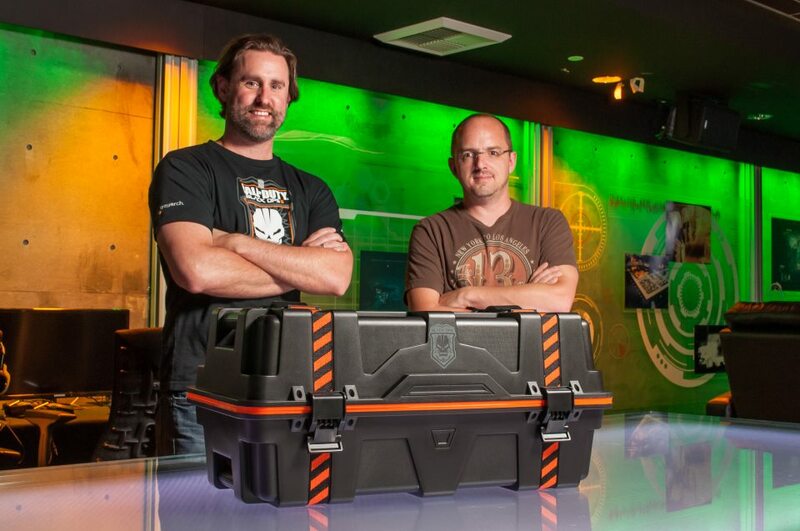 The Care Package's remote-control toy and elaborate box should push it well over $100. GameStop and other retailers aren't accepting pre-orders on the two bundles yet. Presumably we'll have to wait until Activision officially announces them. Update: Activision has confirmed that the Prestige bundle is $79.99 and Care Package is $179.99.